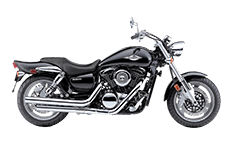 The metallic grace of the Suzuki Boulevard M95 makes it quite a beast for anyone who chooses to ride, but the journey doesn't stop when the tires hit the road. In order to fully take advantage of your next commute to work or vacation, your bike needs to be outfitted with the latest and greatest luggage bags fit for the job. We proudly feature this fine collection of saddlebags designed specifically for the Boulevard M95 series motorcycles, giving you the ability to quickly mount your luggage the way that it was intended.